There are so many things to do and a places to go in Sonoma County that it 's hard to pick just one thing to do. There just never seems to be enough time to do everything you many want to do and in this economy some options are just flat-out expensive. So if you're looking for something to do for the weekend or a lazy mid-week day that's easy on the wallet and tasty to boot then here's an idea I discovered a couples years ago. 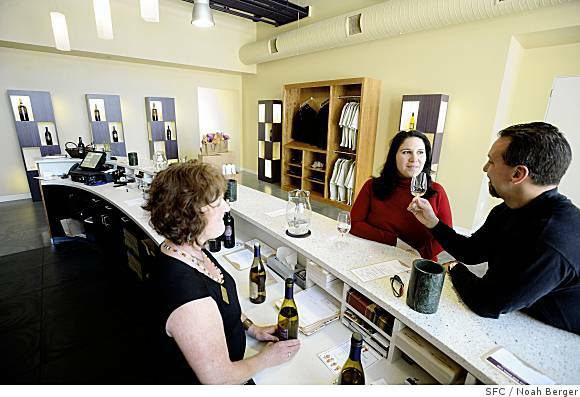 Well I've an idea; how about spending some time in Sonoma County, getting your sip and slurp on in one of the many welcoming tasting rooms waiting to help you quench that thirst. Now for the good new, if you happen to have a Visa Signature Card* then you are luck, as any holder of their card is going to be able to get a sip of the good life for free. Yep you heard me right "free", however see their website for all the details [because restrictions do apply]. The football season is approaching rapidly [finally], but honestly folks what better time could there be to hit the wine-tasting trail, veraison has kicked into gear giving the vineyards some great color. And of course it's still pre-season plenty of time left to for a great weekend among the vines, remember guys if it's your idea you'll look like the hero [wink-nod]. And of course the best part is that wineries of Sonoma County worked out a sweet-deal with Visa Signature Card to defray the cost of wine-tasting. To make it even easier there is a printable map which directs you to all the participating wineries, over 70 included on the list. I'm pretty sure you'll find one that floats your boat. Perusing the list, I see many of my favorites, like Rodney Strong, Roth, Rued, Seghesio and Twomey Cellars to name a few. Here are some of the possible benefits awaiting you: But you may want to hurry as this offer appears ending just before the beginning of the new year [participation varies, call ahead to confirm details]. Seems like a pretty good deal for the wandering wino and great way to kick-off what might otherwise be just a dull weekend. So your get your empty glass over to Sonoma and give those wines a swirl. The weather is perfect right now and again it's a great time to hang in Sonoma County. While you're there, I would recommend having lunch or dinner at the The Girl and the Fig, a sensory experience not to be missed. Okay folks that is all I have for you on a sleepy Sunday right before the official kick-off of the NFL season [Go Pack Go]. So until next time sip long and prosper, cheers!